The University of Michigan-Dearborn softball team can finally take a breath and enjoy the soggy, Michigan weather. Since March 4, the Wolverines had been competing in sunny Arizona at the 2016 Tucson Invitational. The trip out west was an overall success for the Wolverines, as they compiled an impressive 14-9 record. Even though last year’s softball team hung a banner, the Wolverines are looking even better this year. 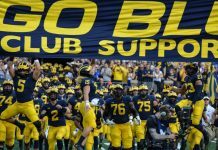 In the 2015 season, the Wolverines opened in Florida and came out of the gate slow, posting a mere 7-11 record. Sophomore Jordan Ewald recalls that season, and is pleased with how the current season began. Perhaps one of the most encouraging statistics from the trip was the team’s record against nationally-ranked opponents. The Wolverines’ first taste of nationally-ranked competition came from a March 7 matchup with the No. 25 ranked University of Saint Francis (IL). They proved they were capable, as the Wolverines took down the Fighting Saints in a thrilling 7-6 nailbiter. Early on, the Wolverines were down 2-0. The deficit remained until the bottom of the third inning, when an RBI single from Ewald tied things up. 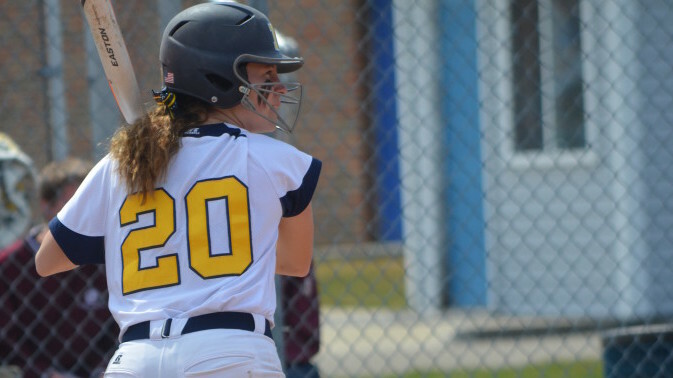 In the Wolverine’s half of the fourth inning, Mackenzie Towbridge put the Wolverines on top for the first time in the game with a home run, making it 3-2 Wolverines. USF would not wait long to strike back, scoring two runs in the bottom of the fourth and fifth innings to chase Wolverine starter Gina Verduzco and to bring the Fighting Saints a 6-3 lead. Relieving Verduzco was freshman Candace Kitchen, whose stellar performance at the back end of the game kept the Wolverines in it. The Wolverines needed some offense, and they got it. Val Bertani tied the game at 6-6 with a clutch, two-run double in the top of the sixth. Senior Nikki Payne plated Morgan Larkin on a go-ahead double, giving the Wolverines a 7-6 lead. With the winning run on base, Kitchen struck out the final batter of the game. The Wolverines had earned a very impressive victory. Ewald talked about what games against big teams can do for her team. On Mar. 11, the Wolverines were tested by the 12th-ranked team in the nation: Dickinson State University. The Wolverines were ready, as they crushed the Bluehawks (6-6) 15-6. The DSU Bluehawks of North Dakota were on the ropes early, as UM-Dearborn started the game on a relentless offensive tear. By the end of the first half-inning, the Wolverines had hung a six-spot on the scoreboard. Bluehawk starting pitcher Abigail Brooks was chased from the mound after recording only one out in the game. The Wolverines knew the most important thing to follow a big inning at the plate is a shutdown inning on the mound. That is exactly what they got. DSU was retired in order in the home-half of the first inning. Just as soon as they had jogged back from a long inning in the field, they were heading right back out. Ewald led off the second inning with a solo homer, furthering the lead to 7-0 and crushing the Bluehawks’ spirit. 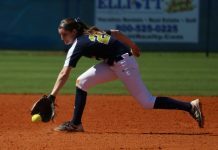 The Wolverines would go on to score in every inning of the game, highlighted by six runs in the first and fourth innings. Ewald and Alexis Powell both homered in the game and collected three RBI each. Senior Alex Elwell tallied five runs batted in on the game. The game would end after only five innings. The win over Dickinson State was the third in a row for the Wolverines, who were showing signs of a team on a tear. Full team efforts led to the Wolverines winning their last two games on March 10 over Presentation College and Ashford University. March 11 saw the Wolverines sweep the day. UM-Dearborn won their matchups against Dickinson State, Mayville State, and the College of Saint Mary. March 12 opened with a Wolverine blowout of Robert Morris University. The Wolverines were not on a little hot streak, but a full-blown tear. During this six-game winning streak, the Wolverines were outscoring their opponents 58-25. Opponents, as a whole, could double their score and still lose. As all good things do, the Wolverines stretch of dominance would come to an end. 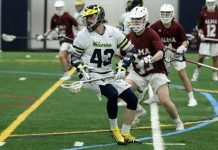 On March 12, in the Wolverines second game of the day, the team had a rematch with No. 12 Dickinson State. This time Dickinson State took every opportunity, and the Wolverines could not catch up as they fell to DSU by a score of 11-3. 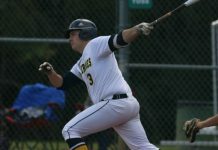 The Bluehawks would put the game away by scoring five runs in the fourth inning. The loss may have ended the Wolverines’ winning streak, but did not come without its lessons. The Wolverines finished the trip outscoring opponents 158-101. They averaged 6.87 runs per game while holding opponents to only an average of 4.69 runs per game. At the end of the trip, the team may not be pleased with the mid-40’s temperatures of Michigan, but they can be pleased with how they performed. Following the grueling 23 games in eight days, the team will get a chance to rest for a while until their next game at Ashland University on March 31.